Posted bysolinox	 September 2, 2014 September 2, 2014 Leave a comment on She’s Gonna Blow! Or she’s not. Or maybe she’s going to bleed to death. Or fart so badly she’ll clear the planetary room. Who is she? 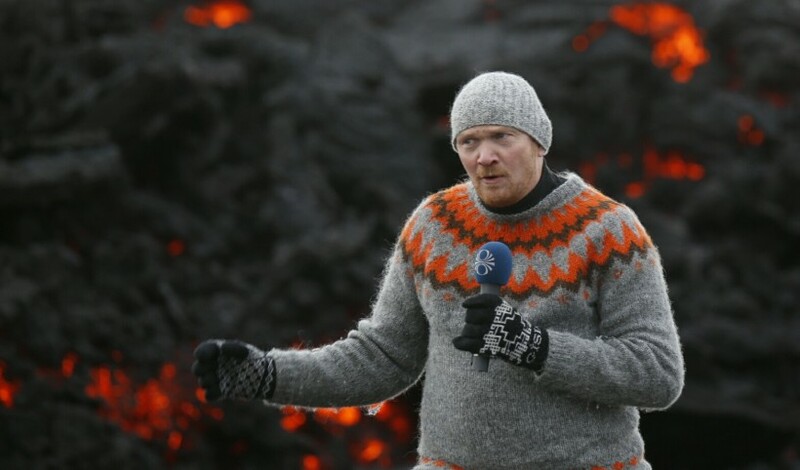 Bárðarbunga, of course. Or maybe Askja. Or Holuhraun. Or Herðubreiðartögl. Or Grímsvötn. Or Laki. (I’m going to have to figure out how to just switch to an Icelandic keyboard layout if this keeps up.) Brian calls me a geek. Sure, fine, whatever. I’ve been glued to the Icelandic volcano news for the past two weeks. Volcanoes and earthquakes and geology in general have been one of my interests my whole life. It’s not often you can learn something new about volcanoes when you’re just an armchair volcanologist. I learned about plate tectonics and the major types of eruptions and the Richter scale when I was a kid. Every once in a while, an interesting event happens somewhere in the world, and I might learn something new as the reports roll in. Otherwise, as with my armchair interest in meteorology and cosmology, at a certain point there very often isn’t much new to learn when you’re not one of the guys working in the trenches. This year, though, Iceland is bringing the game to a whole new level. Iceland is already one of the most geologically interesting places on the planet. It combines a spreading plate rift with a hot spot, creating just about every type of eruption and lava flow you ever see on the planet all in one place. It is constantly active; like Hawai’i, Iceland is so accustomed to its volcanoes that unless residents are in the path of a jökulhlaup (there go those characters again) or gas or lava, it’s just another piece of the scenery, someplace to go take pictures that impress the rest of the world. We all heard about Eyjafjallajökull in 2010 when the ash clouds grounded air traffic in Europe and caused ripple effects in air schedules around the globe. But did you know about Grímsvötn (4 eruptions in the last 35 years)? Hekla (4 eruptions in the last 35 years)? Gjálp? How about the Krafla Fires, a near-constant eruption that lasted from 1975-1984? If Iceland is constantly erupting and spitting lava anyway, what makes the current activity so interesting that it would pull so much of my attention? The sheer quantity and magnitude of the activity, for starters. 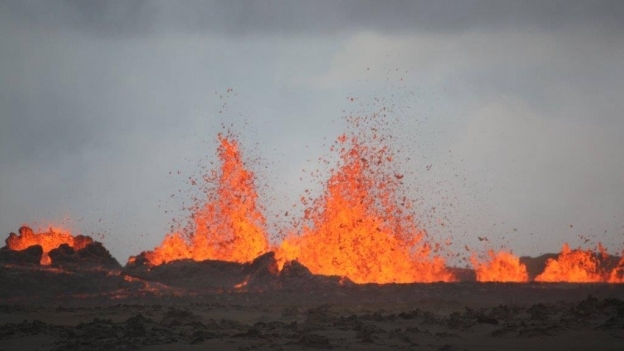 Almost overnight, the area around Bárðarbunga went from producing infrequent baby quakes of less than 2 magnitude to constant quake activity between 1 and 3 magnitude. Starting around the 22nd-23rd of August, the area started producing quakes of magnitude 5 or greater several times a day. These quakes are so big that they are off the scale the Icelandic Met Office uses to chart them. They are the kinds of quakes that used to happen maybe once a year, but now they are happening more than once a day. Earthquake activity from August 16-17, 2014. Earthquake activity from August 23-25, 2014. It’s not just the temblors that are big. The amount of magma flowing around through these systems has been compared to the flow rate of the Hudson River. This magma is flowing through a dike that started in the Bárðarbunga system, headed briefly for Grímsvötn, then turned sharply and shot straight for Askja, ending up in the Holuhraun plains on the edge of Askja fissure system. 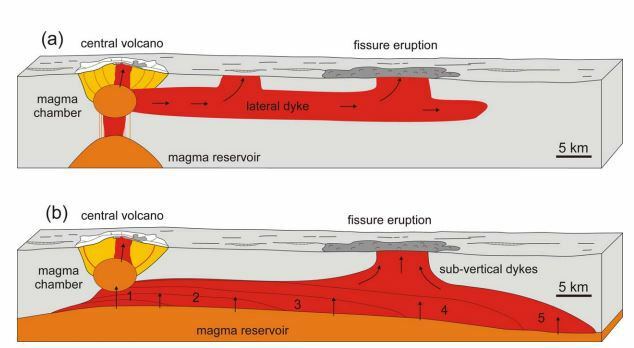 This dike is so close to the surface that it leaks, causing sigkatlar in Dyngjujökull glacier near the Bárðarbunga crater along with the current Holuhraun fires just north of the glacier’s edge. The quake activity has followed the progress of the dike, with major quakes now happening from Bárðarbunga crater all the way to the Herðubreiðartögl fissure system on the other side of Askja. 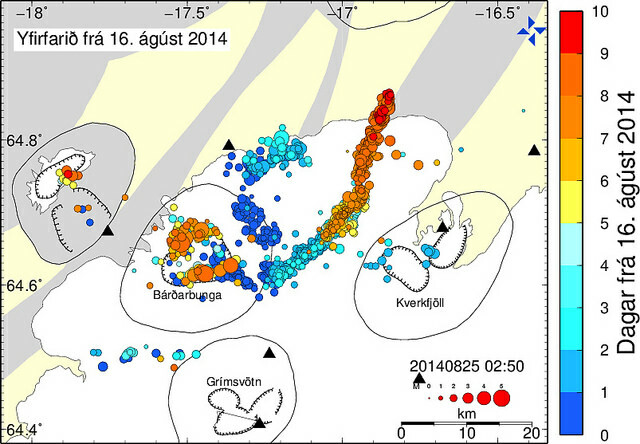 Map of quakes in Iceland from August 16-26, 2014. In case you lost track, that is three major volcanoes that are now involved from two separate fissure systems. One system, including Bárðarbunga, Grímsvötn, and Laki, has a history of eruptions containing extremely large volumes of gas. The last major eruption in this system was the Skaftár Fires, an eruption that lasted for eight months from 1783-1784. The effects of this eruption included dead livestock in Iceland, fluoride poisoning and illness all the way to Scotland, sickening fog throughout Europe, and global climate effects including a frozen Mississippi River and ice in the Gulf of Mexico. The other system, around Askja, has a history of explosive eruptions. Its last major eruption in 1875 led to the emigration of a huge swath of Iceland’s population. Askja has been restive for the past four years, showing increased quake activity, melting ice, and a landslide as recently as this July. Aftermath of the July 23, 2014, landslide in Askja. 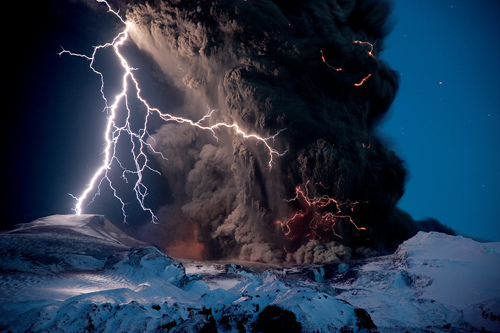 Geologists and volcanologists in Iceland and around the world have been baffled by the activity of the past two weeks. Conflicting reports are issued: It’s erupting! No wait, we were wrong. No wait, there’s evidence of an eruption, but there’s no evidence of an imminent eruption. (Thanks, Páll Einarsson!) Air traffic alerts go up to red, back down to orange, up to red, down to yellow, like a roller coaster. Better check the web before you take off, and it might change while you’re in the air. For the past several days, we’ve finally gotten to see honest-to-goodness, actual red-hot lava coming out of the ground in Holuhraun, but the quake activity has still not decreased even though the amount of lava is comparable to the Krafla Fires at their peak and the amount of sulfur dioxide being released already covers an area as large as Iceland itself on satellite imaging. Even the experts have no idea what’s going on or what to expect. It could all stop and go away tomorrow, or the magma from Báröarbunga could meet the very different magma from Askja and cause both systems to go up in a massive double eruption with global impacts. Competing theories on the source of the current activity in Iceland. Nobody knows. Nothing like this has ever happened in the history of our ability to monitor these volcanic systems. Nothing like this has ever been recorded. Nobody knows what it might do. So we all sit back, watch the Fires and graphs and maps, and speculate on the next act of the play. Stick around. I’ll make some popcorn and smores later. For more information, follow Rei at Daily Kos and the Volcano Café blog. 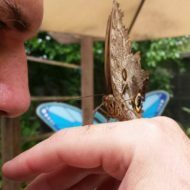 Both sites are chock full of fascinating information, and Rei in particular posts English-language updates daily or more often.